These are the interviews of engineers who have used midas Civil for their projects. In 2006, I was tasked to evaluate several structural analysis software packages, and to select the best alternative for our office. Following several weeks of trials, I selected Midas Civil, and after several years of usage, I am very pleased with my choice. Coming from using non-graphical interfaced structural analysis programs, the selection of Midas Civil was an easy choice. The graphical interface was powerful, intuitive, and very easy to use. The menu structure and the maneuverability of the program were simple to learn and fast to get use to. The capabilities and scope of the program have proven thru the years to be everything a structural engineer needs by its side to provide an efficient and effective structural design. The output results are handled via the graphical interface or spreadsheets. Either way, output is detailed and easy to obtain. Output and results are handled with a powerful graphical interface where deformations, forces and stresses are viewed on any direction or thru a cross section cut. The program can be described with one word: amazing. Excellent customer technical support is as important as the software itself, and Midas has provided thru the years excellent support. The support personal are knowledgeable not only of the software itself, but of engineering in general. Support answers to my technical questions have been prompt, honest and always courteous. "Output and results are handled with a powerful graphical interface where deformations, forces and stresses are viewed on any direction or thru a cross section cut." "Beneficial in our iterative process for final design"
Garver first started using MIDAS a couple of years ago and we have been impressed with its capabilities. So when our team was shortlisted for the US 69 Bridge project, we naturally chose MIDAS to develop a global model of the bridge that would provide us reliable results. Now that we are in the final design phase, we have further developed the MIDAS model and are using it extensively in our design process. Our engineers that have been developing the model have been very pleased with its functionality and ability to create large models efficiently. The ease of inputting and updating our cross-sections, where properties are reliably calculated, has been beneficial in our iterative process for final design. Also, the ability to import input data and export results quickly allowed us to easily adapt our pre- and post-analysis tools to MIDAS. The technical support has been great throughout our learning curve. Whenever we have modeling questions, the support team has been very reliable in getting back to us and generating solutions to any of our modeling issues. The on-line tutorials and webinars have been very helpful whenever we introduce younger engineers to MIDAS, and have gotten them up to speed much quicker than we expected. "The ease of inputting and updating our cross-sections, where properties are reliably calculated, has been beneficial in our iterative process for final design." 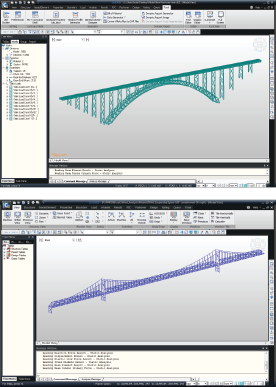 "Help users take full advantage of the software"
I have been using Midas Civil for over six years, and I have found it to be a powerful and flexible tool for bridge analysis and design. The program has a user-friendly interface that allows new users to become productive very quickly. It also has a wide range of analysis capabilities, allowing users to perform complex tasks such as construction stage analysis, buckling analysis, and analysis of time-dependent concrete behavior. My experience with Midas technical support has been outstanding. My questions are always answered promptly, and numerous online tutorials and demonstrations are available to help users take full advantage of the software. Midas Civil is a great option for engineers looking for user-friendly, highly functional structural analysis software. "The Excellent Computational Tool for Bridge Design"
I first used Midas Civil while working on the Ohio River DB project last year, and am pleased to address that it provided a set of advanced and practical solutions that has unique features among any other bridge software. The first distinguishing features were its user-friendly interface and text editor that can handle a complex structural modeling easily. Especially text editor can be interacted intuitively to graphic interface. Defining composition section is also my favorable aspect of the Midas Civil. With the feature composition sections can be defined in an elaborate way for steel and concrete girder composite bridges. Another notable feature I recognized during a recent project is Midas includes multiple solution techniques to solve a nonlinear static or dynamic problem. It is for these reasons that Midas Civil will benefit to bridge engineers to meet their satisfaction. "Always been there for us"
When a design steps outside the normal parameters that black box programs handle so well, it’s critical for our design team to have a versatile tool that can adapt to any structure type and allow the designer to really understand the structure’s behavior. MIDAS provides us with the ability to easily and intuitively model any bridge type and construction scenario. We can choose between different types of analysis, examine load effects individually or in combinations, and evaluate how a bridge behaves throughout all stages of construction. Because we control how the structure is modeled and we control the data the program reports, we can quickly extract the exact data we need in our design process. The on-site training provided by MIDAS was very well done, but the program can also easily be self-taught. MIDAS technical support has always been there for us when we’ve needed them. Often they just need to point us in the direction of the right tutorial in their large library. When the solution is not so easy, they’ve made our problem into their problem and spent time understanding our needs and providing solutions. We’re certainly not MIDAS’ biggest client, but I find that the support staff at MIDAS knows our engineers, knows our projects, and treats us like we are. "Because we control how the structure is modeled and we control the data the program reports, we can quickly extract the exact data we need in our design process."